The 2009 Drum Corps International Tour is getting more and more exciting as corps continue to travel the country, presenting their breathtaking shows at more than 100 events in nearly 40 states. Whether long-time supporters or first-timers, no DCI event would be complete without the excited and sometimes eccentric fans from around the country who come out to support their favorite corps. Don't miss a second of the exciting action from the world's most elite marching music ensembles—join these extraordinary fans at the next DCI event near you! 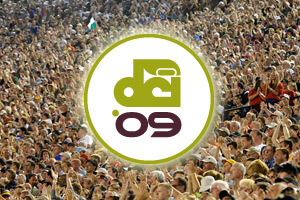 View the complete 2009 DCI tour schedule. 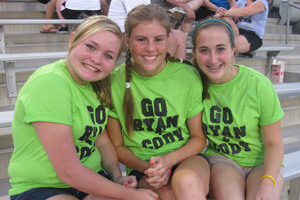 These fans attended the DCI Houston event at the Berry Athletic Complex on July 16 and 17. Ava White and Esmer Lizardo, from Conrad Texas, spent nearly four hours making this brightly colored sign to bring to the DCI Houston event. 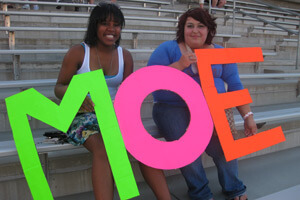 "My best friend Moe is in the Cavaliers' color guard—it's his first year—so we came out to support him. We were really excited for him when he made it, because color guard is his life," Ava explained. Stephen Johnson (right), from Katy, Texas, has been watching drum corps competitions for about 20 years and took advantage of the close competition in Houston to catch his favorite corps. 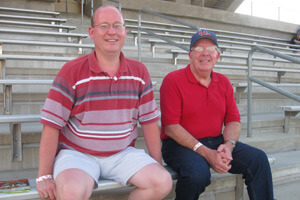 He brought his father-in-law, Walter Holmes, who saw a drum corps show for the first time last year. "Last year I said, 'I've never seen anything like this' so I came back this year," he said. "I appreciate the precision and the unique style that each of the corps have." Henry Chica (right) experienced his first drum corps show this weekend at the Houston area event. He and his friends Vy Nghyen and Eric Garcia are students at Cypress Falls High School and attended both nights of competition. Henry said he decided to come to the show because he'll be a drum major in the fall and he wanted to see really good drum majors in action. Vy, who has a friend who is marching as a member of the Bluecoats, said, "I wanted to come out to support him. I'm also going to be a drum major this year, so I wanted to experience marching music at its finest." Eric said he came out to the show because he simply loves drum corps. "I'm one of the guys that is crazy about it, I always do my best to see any drum corps that I can all the time. It's so intense and loud, it's just awesome," he said. Eric plays trumpet in his marching band and particularly liked the "screaming trumpets" he heard from the corps. Shannon Tevlin, Blaire Benson and Brooke Beleski are all color guard members in their high school marching band and love to watch drum corps videos online. They came out to the DCI Houston event because a friend is a member of Phantom Regiment and one of their coaches is involved with Carolina Crown. "I came last year and it was just awesome, so I decided to come back again and make shirts to support my friends," Shannon (left) said.